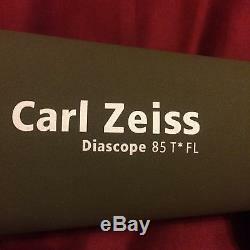 Zeiss Victory DiaScope 85mm T FL Spotting Scope. 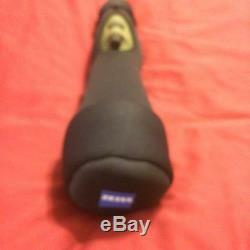 Zeiss Vario 15-45x/20-60x Zoom Eyepiece, Zeiss Cordura Jacket, Nylon/Canvas Carry Case. Excellent / Like New Condition. Zeiss Victory DiaScope 20-60x85 T FL Spotting Scope. Silk Brand Carry Case (After Market Product Zeiss does not make/provide carry case with product). 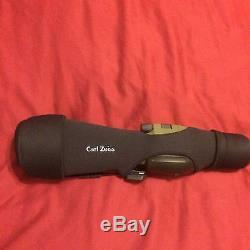 This scope is in excellent/like new condition. There are no scratches, blemishes, etc. This scope has been used for a few one week outings and was always wiped down clean and dry each day in the field, as well as after returning home from the field. It was always stored indoors between outings. It is by far the best spotting scope that I have ever used or heard of. It easily gives an extra 30-45 minutes more viewing time at both dusk and dawn, than does any other spotting scope used by my friends or me in the field. The quality, color depth, clarity and crispness of the image viewed in this scope is also far above that of any other scope that I have ever viewed through. Special Note To International Buyers. Employing an advanced optical path that delivers maximum contrast and stunning color fidelity, the DiaScope spotter provides high-resolution viewing and excellent twilight performance. Featuring T multicoated fluoride glass lenses, the DiaScope's field of view offers crisp edge-to-edge clarity with resplendent details. To ensure optimum viewing regardless of the climate - the rugged ergonomic housing is sealed, waterproof, and the internal lens surfaces are totally fogproof. A significant increase in the DiaScope's all-weather performance would seem impossible - yet - the exterior lens surfaces have been treated with Zeiss' LotuTec water-repellent protective coating to ensure the clearest view possible in any weather conditions. This particular DiaScope provides straight-through viewing and it's configured with an 85 mm objective lens. Without an eyepiece, it measures 13.6 in length and it weighs in at 52 oz/1.5 kg. The mounting foot is threaded to accept either 1/4"-20 or 3/8"-16 studs, and its rotating collar can be adjusted to provide a comfortable viewing position in nearly every situation. The DiaScope's Dual Speed Focus (DSF) system is easy and intuitive to operate. The DSF's centered focus knob is geared for fine focusing within a 270° radius of an established focus - outside of that zone the focusing speed increases rapidly. When the observer finds a new focus, the DSF automatically resets to precision mode for fine-tuning the view. 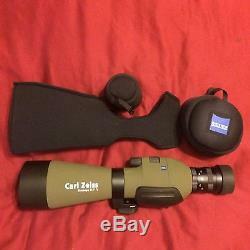 This spotting scope package includes the Vario 15-45x/20-60x eyepiece. Its variable magnification capability adds versatility and flexibility that accommodates a variety of viewing situations. When used with the 85 mm DiaScope, this eyepiece provides 20-60x magnification. Optically, the Vario eyepiece has been engineered to match the performance of the DiaScope T FL spotters. Achromatic fluoride-glass lenses have been implemented for their exceedingly high level of visual acuity and accurate color rendition. The exterior lens surfaces have been graced with a protective LotuTec coating that sheds water, mist, fog, and oils. By minimizing the presence of these image-dispersing contaminants, the LotuTec coating maximizes the lens' optical qualities. Every air-to-glass surface of each lens has been fully multicoated with Zeiss' proprietary and legendary T coating to ensure optimum light transmission, contrast, and color fidelity. A simple yet robust bayonet mount ensures that the eyepiece fits securely to the DiaScope's housing - a simple twist-to-attach operation puts the ocular into its working position. Eye/sunglass wearers will greatly appreciate the eyepiece's generous 16 mm of eye relief along with the adjustable twist-up rubber eyecup. Eye relief: 16 mm / 0.63. Focal length: 25.1 - 8.4 mm. Magnification with 85 mm DiaScope: 20-60x. Twist-up rubber eyecup for a customized view with/without eye/sunglasses. Sealed barrel is purged with dry nitrogen for reliable waterproof/fogproof operation in any climate. LotuTec coating: Sheds water, dirt, grease, grime. Lenses can be wiped clean without smearing. T multicoating: lenses are fully multicoated with T coatings to reduce flare, improve contrast, enhance light transmission. FL Concept: fluoride glass lens elements deliver brighter and sharper images with accurate color and higher levels of contrast. They minimize chromatic aberrations while virtually eliminating stray light interference, image fuzziness, low contrast. AFOV with 15-45/20-60x eyepiece: 50-72°. Thread for adapting photo/astro adapter: M 45 x 0.5. Lightweight housing is rugged, waterproof, and fogproof. Integral retractable lens hood shades and protects objective. Focus knob is ergonomically positioned for intuitive operation. Rotating tripod collar with 1/4"-20 and 3/8"-16 mounting threads. DSF - dual-speed focusing: when a subject is in clear focus, the system sets itself into Precision Mode where a 270° rotation on either side of current focus is slow and precise. Outside of that zone the focusing speed increases 5x. Once a new focus is established, the system automatically drops back to Precision Mode. The item "Zeiss Victory DiaScope 20-60x85 T FL Spotting Scope, Zeiss Vario Eyepiece, More" is in sale since Thursday, April 21, 2016. This item is in the category "Sporting Goods\Hunting\Scopes, Optics & Lasers\Spotting Scopes".bill222" and is located in Houston, Texas. This item can be shipped worldwide.